ADT Pulse for iPhone, Blackberry or Android Smartphone. 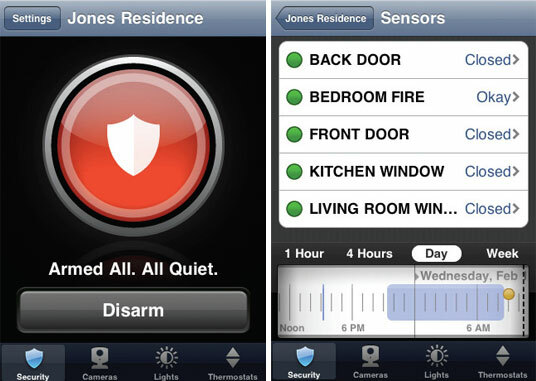 With ADT Pulse ARM or DISARM your ADT home security system from anywhere with your iPhone, Blackberry or Android smartphone. It’s a mobile world with information at your fingertips. Would you like to know what’s happening with your ADT Home Security System at any time? Is my alarm system currently armed? Did the kids get home by 3:30pm and disarm the system? Was my liquor cabinet or gun cabinet opened? Is someone in my master bedroom? If you have an elderly relative, how nice would it be to know that there’s been an medical emergency? Most of use have a mobile phone with us at all times. With ADT Pulse you now have the convenience, control and notifications of alarm events from any web enable mobile device or from any computer with Internet connection. This is most exciting advancement in the security industry for years. ADT Pluse Home Security System and Monitoring will change the way you use your security system and enhance your lifestyle. Remote ARM/DISARM from your web enable mobile device or computer with Internet connection. How often do people get to work and wonder… is my security system armed? Now you can just look at your Smart Phone and check to see. If it’s disarmed you can now just simply arm it from your mobile device or your computer. You could arrive in Paris for a romantic vacation and realize you may have forgotten to arm your alarm system. “Don’t worry Dear”, I’ll check in to our ADT Pulse System and arm it right now… let’s just relax and enjoy our vacation together. With the option to arm and disarm your security system remotely, you will be able to have your trusted handyman or contractor call you when they arrive to make a repair on your home and disarm the security system remotely. When their leaving, have them call you and then rearm your home security system. This stops you from having to give out your security code to everyone who needs to enter your home when your not there. Convenience and Control! Receive notifications of alarm events via text or emailhttp://www.californiasecuritypro.com/blog/bid/201068/Setting-up-Text-and-Email-Alerts-with-ADT-Pulse. If someone breaks into your home you will be immediately notified when the alarm system sounds. You will also be notified if someone at home pressed one of the emergency panic buttons on the keypad and whether it’s police, fire or medical emergency. You will also be notified via text or email if a member of your family pressed the panic button on their key-chain remote or medical alert panic button. By adding other personal emergency response equipment you will be notified of carbon monoxide poisoning, water/flood detection (laundry room, basement, etc. ), low-temperature monitoring (before your pipes freeze at your cabin) and with Monitored Smoke/Heat Sensors you’ll be notified in an event of a fire. While you are receiving these notifications your ADT Pulse Security System will also be sending signals to ADT Central Station. The ADT Central Station Operator will be calling your home to verify alarm events, contacting emergency contacts and most importantly calling your local police department, fire department or the paramedics to respond to your emergency. You can also set up notifications of non-events. For example, your teenage daughter is supposed to arrive home by 3:30pm after school. You can set up the ADT Pulse System to email or text you and your spouse if your home security system is not disarmed by 3:45 Monday- Friday. You could then check in with your daughter….. “how’s your afternoon Sweetheart?” Have an elderly parent with medical conditions who forgets to take their medicine. No problem… put a sensor on the medicine cabinet or a tilt sensor on their medicine bottle. Set-up your ADT Pulse System to notify you and their caregiver at 11am that mom has not taken her medicine this morning. Give mom a call, “Hi Mom, I love you and just checking to see if you’ve taken your medication today.” Or be notified Monday – Friday if your alarm system was not armed by 10:00am and then immediately arm it. The possibilities are truly endless. Be notified of any device events whether or not your ADT Pulse system is armed or disarmed. Kids are not supposed to be in your master bedroom when your not home…. put a motion sensor in your master and be notified any time someone enters your master when you are away. Don’t want anyone in your liquor cabinet…gun cabinet…medicine cabinet, put a sensor on the cabinet and be notified when it’s opened. Don’t want anyone to pickup an art piece, move your safe, or run off with your flat screen…. place a tilt sensor on it and be notified any time it moves. Once again the possibilities are endless. You can setup multiple users family members, friends, neighbors, caregiver, etc to be notified about different events or device notifications. Text one person, email another, you decide what events and to whom you what the notifications sent to. Going out of town, change the notification setting right from your computer. ADT Pulse truly puts you in charge based on your personal lifestyle. For more information about the ADT Pulse Home Security System call 1-800-310-9490.